As coaches we are often expected to act as mentors, technical experts, motivators, physical diagnosticians, nutritionists, strength trainers, statistical analysts, etc. There are an incredible number of roles we play, and there is no conceivable way we can be experts in all of them. And yet, we have to take on these roles to do our job. Ideally, we would have an Integrated Support Team that has all those experts at our disposal… But that’s not going to happen. So we get whatever experts are available and affordable, and we muddle through with everything else. I wasn’t too concerned with this state of affairs until my son showed me the following picture, which seems to be from the Saturday Morning Breakfast Cereal web comic. 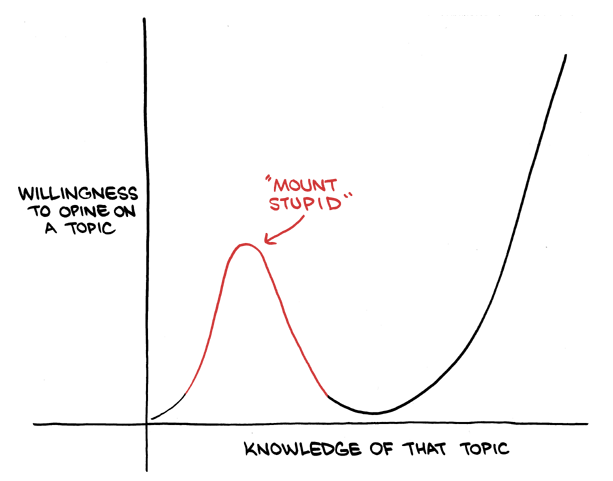 Unfortunately, I immediately recognized myself (and many other coaches I know) perched happily on the summit of Mount Stupid. Only we’re not just talking as if we know all that stuff, we’re coaching as if we know all that stuff. But in reality, how could it possibly be different? I doubt that there are many coaches in the world who are experts in designing training programs, sports psychologists, motivational speakers, sports doctors, technique masters, strength and conditioning experts, operational managers, and a host of other roles. And I doubt there are many programs in the world that have all (or even most) of those experts standing behind the coach, ready to help at a moment’s notice. I shouldn’t tell you what I think you should do. That would just be another sermon from Mount Stupid. But I can tell you what I’m going to do. I’m going to try to move into the valley to the right. Let’s call it the Valley of Awareness. I’m no more knowledgeable there, but at least I know that I’m not knowledgeable. That’s a good start. I can honestly tell you that our program is already much better after bringing in experts in nutrition and strength and conditioning last year. And next year we’ll have a massage therapist. Those experts help the team so much more than my unknowledgeable attempts ever could. The only problem is the view. It was so much nicer on Mount Stupid. I learned too many lessons on the top of Mt Stupid. Those lessons come at our own expense (and sometimes others) and we are soon tumbling into the Valley of Awareness on the right or the Valley of Ignorance on the left. As we progress to Stage 4 we end up at a new Stage 1. 1. Open – what is known to ourselves and to others. 2. Hidden – what is known to ourselves but not known by others. 3. Blind – what is not know to ourselves but is known to others. 4. Unknown – what is not known to ourselves or to others. As coaches we are students – always learning (or we are meant to be). We must accept our world-view as questionable and challenge what we know and what we don’t and, as you suggest, ask for help so that we can best help the swimmers we serve. Thanks Jim. Good detective work. I disagree with your view, my view from Mount Stupid is better, but then, I may have been there longer and I may be looking the wrong direction. Hi Gary, Next time you’re up on Mt Stupid, look me up. I was granted permanent residency status there just last year.